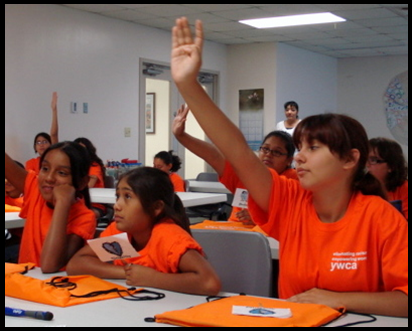 The YWCA YWTeen Program begins on Elementary and Middle school campuses with one-hour classes every week during the school year. YWTeen Group Leaders guide 5th and 6th grade girls, ages 10-12, through exercises that build self-confidence, encourage healthful lifestyles, teach strong decision-making, and promote leadership. To respect others who are different from themselves. 93% of participants have learned to make stronger friendships.